Coloring Mandalas, A Few Snapshots, Minneapolis, Minnesota, January 2008, all photos © 2008 by QuoinMonkey. All rights reserved. Relaxing Saturday winter night. Liz and I are coloring mandalas and watching a documentary on Beat Generation poet, Lawrence Ferlinghetti. Liz bought a book on Coloring Mandalas by Susanne F. Fincher. It contains 48 sacred circle designs for a means of entering the Circle of Life. There are many ways to approach mandalas. We’ve decided to follow the structure of the mandalas of The Great Round, as identified by American art therapist, Joan Kellogg. There are 12 mandala forms associated with each stage of The Great Round. We’re starting with Stage 1, the Void, in January. Stage 2, Bliss, in February. Stage 3, Labyrinth, in March. Well, you get the idea. Creating a mandala begins with drawing a circle. It can be as simple as the circle a child draws or as complex as the sacred images created by Tibetan monks. Mandalas arise from the compelling human need to know our own inner reality, to align this knowing with our body’s wisdom, and to awaken in ourselves a sense of being in harmony with the Universe. As Lama Nubpa Chodak Gyatso has explained, mandalas are “manifestations of the lucid radiance of being.” The word mandala, from Sanskrit, the ancient language of India, translates as “sacred circle.” In Tibetan the term for mandala is kyil-kor, which means “center and circumference.” In the Eastern tradition mandalas also suggest a complete cycle, such as the rituals that comprise a liturgical year. The word mandala also translates as “cycle,” as in a prayer cycle or a song cycle built around a single theme. A Labyrinth is a mandala. So is a Medicine Wheel, the 12 hexagrams of the I Ching, and the Buddhist concept of emptiness. What does the circle mean to you. Is it openness? Emptiness? Is it inviting, full, safe? Or scary, as in the empty circle of the Void. As the Full Wolf Moon fades and we head into the next New Moon, it is a good time to begin something new. The New Moon symbolizes new beginnings. At the New Moon, you plant the seeds of what you want to come to fruition at the Full Moon. And then, start all over again. The Ouroboros. Yes, the Ouroboros is a mandala, too. It’s time for me to start coloring. The show on Ferlinghetti is over. We’ve moved on to a PBS show on cheetahs. It’s fitting to be meditating on mandalas while listening to Lawrence read at City Lights Bookstore. I’ll keep you posted as we progress with our mandalas. We’d love to hear anything you’d like to share about your own experiences with these sacred circles. Thank you for sharing this. I love mandala thoughts and colors. Not that this is a”word association” game but when you asked the question of what circles/mandalas makes one think of, my immediate images were: Womb, Earth, Karma, Spoons. The last one mainly because of an acquaintence years ago who had no use for knives or forks of any kind; only bowls and spoons she would touch. When I inquired why she explained she preferred circles and did not like sharp edges. This post recalled that conversation…. sibyllae, from a practical standpoint, I wonder how your friend cut the tougher food? Yet I can understand not wanting the sharp edges around. The mandala coloring has been fun. We both competed one last night for January. We might do another one today. It was so soothing and comforting to color, to innately choose the tones and values we each wanted in our mandalas. Very peaceful. I also liked that we didn’t have the pressure of creating our own. I’d like to do that someday. But for now, it’s nice to only have to worry about the colors and shapes already on the page. About the word association, later we are to go back and associate words to the colors we chose. So that will be another layer we haven’t gotten to yet! Thanks for your comment. diddy, I had not seen that link. He really crosses all religions with his work, too. The circle is such a powerful form. I didn’t know until I went to post this piece, how many people were painting and teaching others about mandalas. I wanted to come back and make a comment on Lawrence Ferlinghetti. I find it so inspiring to watch documentaries on artists and writers. It gets me pumped up to do my own work. I mostly see the way they struggled, as well as their successes. But, I tell you, there are a lot of lonely nights that they talk about, too. And a lot of uncertainty. It’s good to know I’m not alone! Anyway, one thing that struck me about the Ferlinghetti documentary was the footage on him and Allen Ginsburg being interviewed. Another part was when Jack Kerouac came to Ferlinghetti’s cabin (kind of a shack really where he painted) and they went to sit by the river. Yes, I’ve got some cleaning to do myself today. I’m heading off, too. Have a good day everyone! It’s warmed up to 25 degrees here in the balmy Midwest. It feels like summer! The Western world seems to want to fill a void. I crave silence after being in the world for a while and have difficulty thinking when I am surrounded by stuff, whether material or sensory. I read the Beat poets years ago so I remember Ferlinghetti with a sentimental fondness. Just the title “A Coney Island of the Mind” calls up the associated, Howl, Brautigan, my first cup of espresso, first kiss, shedding the veils of childhood. 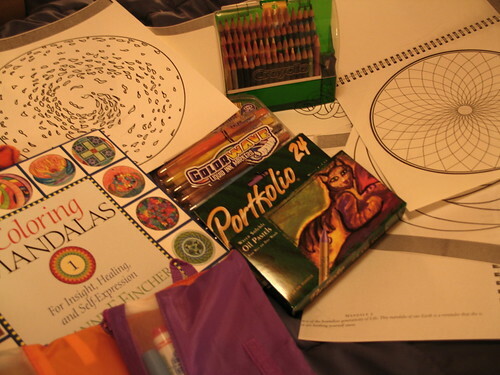 I have used mandalas with emotionally impaired teenagers as a means of learning to relax. It is a magical thing to watch how calming it is, how one learns to appreciate the moment through that focused work. Ivy, that must be rewarding work, using mandalas with teenagers. I was amazed last night at how calming it was, just the practice of coloring, choosing colors. The ritual alone is enough to slow things down. And ain’t it the truth about our crazy world wanting to fill up the emptiness with material things, noise, well, whatever it can fill it up with. I’m the same way, I have trouble thinking when there is too much sensory overload. Yesterday Liz and I walked into a quiet office supply store to make a few copies of the mandalas to color. Then immediately after that, walked into a bustling electronics store to buy a DVD player cleaner. It’s was an assault to the senses. There were a million TV’s, all tuned to the same football channel, computer speakers blaring, high def TV’s all over the place – all that sound and energy buzzing around was so disquieting. I had to comment to the clerk when I left that I didn’t know how she stood working there. She said it was challenging some days. How peaceful to come home and color a mandala. I neglected to say how much I enjoyed reading this today. Thank you. 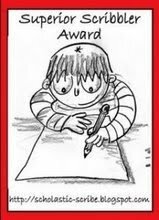 It was rewarding at times. The contrast between mandala time and times of stress was remarkable. I don’t even notice how much the noise and bustle has affected me until I am home and the quiet is like a balm. Have you seen the movie The Last Mimzy? A mandala was a central part of the story. I don’t want to give away the ending but I will say that I was surprised by my reaction to it, realized what an uncommon type of ending it really was, and what kind of ending we tend to anticipate in movies about our possible future. Morning QM. Still fuzzy headed and stuffy nosed over here on a cold cloudy morning. I have a pretty strange story about mandalas. It has to do with a drawing I did and a drawing Jim did, separately but at the same time. I actually hadn’t remembered it until I saw this post and am thinking maybe I should save the story and the artwork for a post of its own. I think I will. I’m also looking forward to seeing some of yours and Liz’s mandala colorings. I love the association with the New Moon, starting things anew. It resonates with my life right now. i’ve signed up for thing-a-day, and blog challenge for february to create something every day. i was tossing around a couple of possibilities — maybe i should create small mandala each day. i started a book of them — i think i only ended up with two in it. but i very much enjoyed the experience. have you guys heard of “zen tangle”? if you google it, you’ll find this cool little kit. the art form seems to have similar qualities/benefits as the mandala. a student in my expressive arts class pointed me to it and then santa brought me the kit. maybe i should actually open the box ….! I had not heard of zen tangle before. I checked out the website. Sounds like they are having a lot of fun with their product, even used it at a recent wedding and for their Christmas cards. I think Liz would really like something like that. She’s very detail oriented in her drawings. I have a hard time sticking to patterned drawings like that. I think that’s part of why I like that the mandalas in this book are already drawn for me. I can work with them without thinking. That’s just me. I’d like to try creating some of my own mandalas though, very freeform and organic. What were the small ones you created like? Did you just draw a circle and add whatever forms you wanted in the middle? I am taking up more exploration around drawing. I’d like to start sketching again. Small ones, maybe just out the window. Liz just got another book called Drawing as a Sacred Activity. She’s studying it for learning about art therapy. But I’m interested because It talks about drawing through the frame of symbols in the home like doors and windows. I have a window that I look out of every single day. It would be fun to start doodling. We’ll see. I miss keeping sketch books! Yet so much of my creativity is still pouring into my writing, which I do every day. It’s tough to balance. Ivy, I haven’t seen the The Last Mimzy. I had not even heard of it but just checked online and it was released in 2007? Must have fallen under my radar. It looks good. I’ll have to check it out. We watch a lot of movies and this weekend, we watched Ebert and Roeper talk about their best movies of 2007. They also have video picks of older movies which always inspires us to go back and see a flick we missed. Anyway, they were talking about how the public at large sometimes gives the thumbs down to a movie because they don’t like the way it ends. We do come to expect certain types of endings. And movies that leave us confused or hanging or disturbed, really give us so much more to think about. When I left the Dylan movie, I’m Not There, was the last time I felt like, whew, what just happened? It doesn’t happen that often though. ybonesy, I hope you do do a post on yours and Jim’s circle drawings. I’d love to read about it and see the drawings. I’m already intrigued. QM: Great post and thanks for the link so that I can download and start my own mandala right away! breathepeace, how wonderful to see your positive energy on red Ravine this morning. What great links!! leslie, myoats reminds me of those Spirographs we had as kids. I got one for Christmas one year and spent hours and hours over the next couple of years drawing out my colored circles. I always loved making circle art. QM, I’ll see what I can dig up of the artwork that Jim and I each drew. If I can find it and photograph it, I’ll definitely do a post. BTW, here is a link to zentangle: http://www.zentangle.com/index.php. I hadn’t seen it either. Doy, I should have included the link! I’m getting lazy in my old age. Have you seen the Spirograph kits of late? They seem so less solid than the ones I remember. leslie, great links. I haven’t seen a Spirograph kit in who knows how long. By solid, do you mean the hardware ybonesy? I’ve noticed on so many of the newer toys (toys from our generations but being produced today), they make them much less sturdier than the toys we played with. The materials have really changed. I finally found a picture of the spirograph I had. leslie, how do I get to this Spirograph photograph? Is it on your site? Love to see it. Do a “copy/paste” into the address box. Highlight the address I gave, and paste it into the browser address box, then hit the ‘go’ button. I couldn’t remember what the name of the darned machine was that I had, and it’s Hoot-Nanny. It was made of metal. leslie, that’s a great photograph. Wow, that really is some serious hardware. They used to be so solid. Thanks for the link. World Premiere: 53RD VENICE INTERNATIONAL FILM FESTIVAL, September 1996. Best Art Documentary: CINEMA ARTS CENTER INTERNATIONAL INDEPENDANT FILM FESTIVAL, Huntington, NY, June 1997.
diddy, that’s a great top secret mission for Brant to do with his Grandpa (not sure what Grandma/Grandpa terminology you all use in your house!). I love that they went and got gel markers and Crayons. Hey, on the mandala books, the book Liz and I are using (Coloring Mandalas, For Insight, Healing, and Self-Expression by Susanne F. Fincher, Shambhala Publications, Inc., 2000) is fairly inexpensive. I think Liz ordered it for $12 or $13. You can color right into her book. But since Liz and I both wanted to do the mandalas, we went to a Kinko’s (no, I think it might have been an Office Max or Office Depot) and made 11 x 17 copies on thick cardstock. That way, we can both work on them and it preserves the quality of the book (which is beautiful). We’ve really been enjoying the book. And I know I’m a big proponent of supporting Independents, but you might be able to order it online more easily (I know Liz ordered hers from Amazon). It could probably be ordered online by an Independent, too. Not sure. Or one thought is the kind of independent spiritual bookstore that Mom and I visit when I am there. You know the one I mean? They might even carry the book, I’m not sure. There are also other books out on mandalas, too. I’m glad you are doing some research and checking them out. QM, thanks for reminding me about the store that you & Mom visit! Gosh, it is probably less than a 1 mile drive for me. We found the book you featured along with others on Amazon. I was actually surprised to see how inexpensive they are. I am also checking out some books designed for children Brant’s age & there are even kits available so that he can design his own. diddy, those look like fun mandalas for kids to color. Looks like you can print them off easily, too. A good find. Hey, what size are they when you print them off? Just curious. diddy, I think the mandalas at your paper mandalas link (Comment 36) will work out great for kids, even if they are small. Circles just seem to have a soothing, calming effect on the Spirit. Kind of about unity and connection. Happy coloring! I mentioned it to Liz and she did a search on HBO – I couldn’t believe it, but The Last Mimzy is on starting today – so she’s taping it for us to watch this weekend. I’m excited to see it and how it relates to the mandalas. I’ll also look forward to the ending. Maybe others will see it on HBO as well. I just remembered I wanted to come back and comment on The Last Mimzy. We did end up watching it and it was kind of fun. I wonder if kids would really be able to follow the undertones – it’s kind “out there” in terms of the layering of meaning. I did like the ancient mandala’s appearance about midway through. And I liked that the movie linked a bunch of writers together. The Last Mimzy was loosely based on the classic science fiction short story “Mimsy Were the Borogoves” by Lewis Padgett (the pen name of collaborators Henry Kuttner & C. L. Moore), which appeared in John Campbell’s magazine Astounding in 1943. Then the film’s and the short story’s titles were derived from the poem Jabberwocky in Lewis Carroll’s novel Through the Looking-Glass, and What Alice Found There. Really links some wild writers together! QM, I wanted to follow up the the website I provide in comment #36. I had printed 25 of the 90 free mandalas for children that I provided the link to. My niece & her 4 year old daughter visited with us yesterday & today. Brant was also here for those 2 days & all 25 mandalas were colored, mostly by the children, although my niece & I did 4 each. The children loved this & now I will need to print more! They both did a terrific job & J has photos of the ones done by Brant. When J has the chance I will have him email the photos to you. They were the perfect size for children & they had a blast! My niece took the link to the website & plans on printing them also & taking them to her daughter’s Kindergarten class (All the same design) & explain the meaning of mandalas & seeing the contrast of differences in each one. How great is that! diddy, I’m just logging on to the Ravine tonight for comments. This is so great about Brant, your niece, and the mandalas. I’m glad you took photos of Brant’s, too. Yes, send them to me when you get a chance. It would be great to see them. That is so funny about Brant signing the name MOM to his 4 tokens! I WONDER where he would get something like that! I’m glad you are having fun with the mandalas. I am, too. I actually had my March mandalas done early and they are sitting over on the piano where I see them every day. I photographed them and need to get them posted, hopefully, before the end of March! samuelgewelson, thanks for stopping by. Saw your comment a few days ago and never got a chance to reply. Just wanted everyone to know how aware I am that I still have to get the mandalas posted for the rest of the months of 2008. And I’m committed to getting them all up on red Ravine as we move into 2009. My mandala practice will continue into 2009 as well. I’ve got one more December one to color for 2008 and plan to complete it this weekend. The 2009 mandala practice will include canvas paintings which I’ll post as I complete them. They move much slower than the markers! Liz also spotted another Volume of Coloring Mandalas by Susanne F. Fincher…well, actually, there are two more Volumes. So I’ll probably end up getting one of those, just for fun. I hope all who do this archetypal practice (and I know there are many) have enjoyed it as much as I have. Very centering. BTW, I was talking with Heather in the Comments on PRACTICE — My First Food Fight – 20min (LINK) about how Sir Paul McCartney found inspiration for his lyrics by opening a book of poetry and looking for “beautiful words” and he specifically mentioned the Beat Generation poet mentioned in this post, Lawrence Ferlinghetti. Another way that poetry inspires. I still see THE CONEY ISLAND OF LAWRENCE FERLINGHETTI (the 60 minute documentary mentioned in the comments above) pop up on either PBS, the Documentary Film Channel or Sundance. It’s really worth seeing.